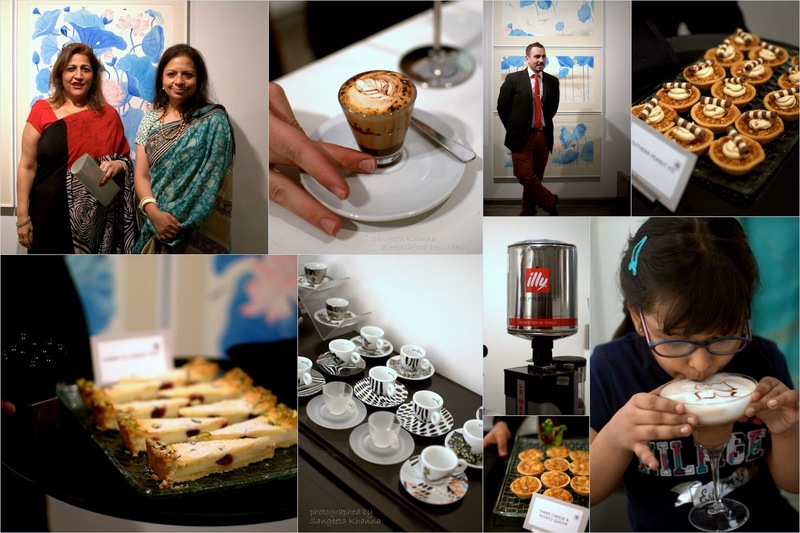 I was delighted to see an invite for a curated art experience over specially brewed coffee by Illy coffee master barista, Nicola Scognamiglio from Italy. 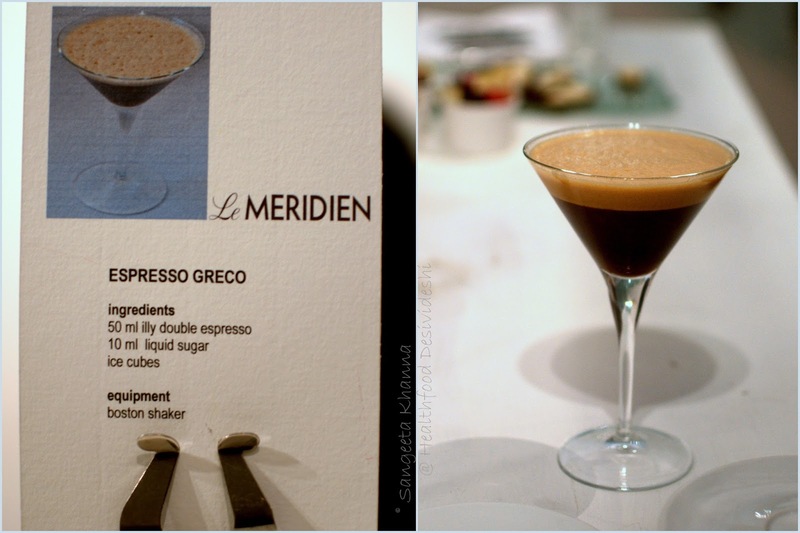 This was being organised by Le Meridien and gallery Espace and I saw it as an opportunity to learn more about coffee. 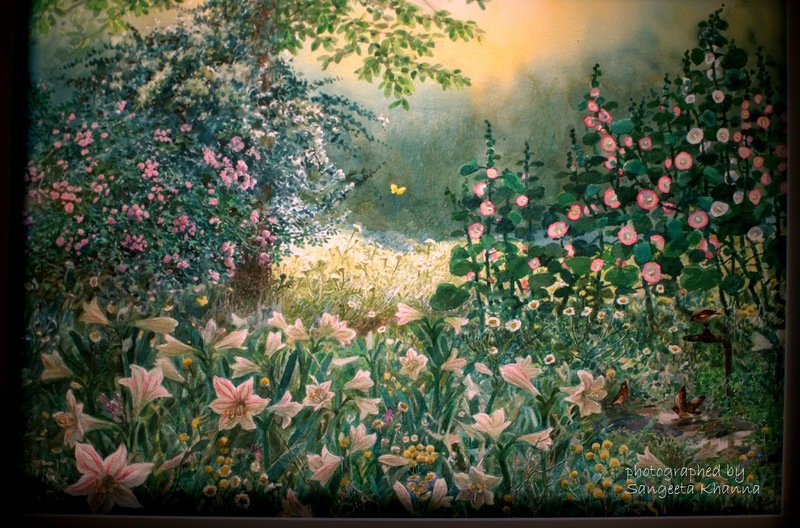 Art was an added attraction, Suddhasattva Basu and Mala Marwah had displayed their art and I loved how Suddhasattva had depicted life as an ecological continuum through a lotus pond and some birds and insects. Incidentally, I had clicked a few lotus pond and bird pictures during my Lucknow visit recently and it touched a chord. I am not much of a coffee drinker, although a strong unsweetened cup of coffee used to help a lot during exams I remember. But that was two decades ago, I know it has been ages. I used to have instant coffee back then, Nescafe and Bru depending on what caught my fancy. Filter coffee we used to enjoy at friends places only because we had no clue how the filtrate makes such a nice aromatic cup of coffee. But my father had taught me one thing very well about making instant coffee, and that is, to 'churn' the coffee with a tbsp of hot water and sugar till it gets a nice creamy consistency and starts intoxicating you with it's aroma. Well, this was a step where you had to whisk the coffee with hot water and sugar vigorously for two minutes or longer and then pour hot milk over it to make a frothy aromatic cuppa, papa called it churning so it is 'churning the coffee' to me till date. I would boil the milk and keep 'churning' the coffee till the time I felt right, many of my white T shirts and kurtas got stained with coffee while doing this churning, and I liked my coffee that way. Later I got a steel filter with two chambers and started making filter coffee sometimes but I guess I became a natural insomniac so the coffee was no more required by the system. Coffee as a flavor is still a favorite. Having a good cup of coffee is still enjoyed lots, even though it's not a daily fix. 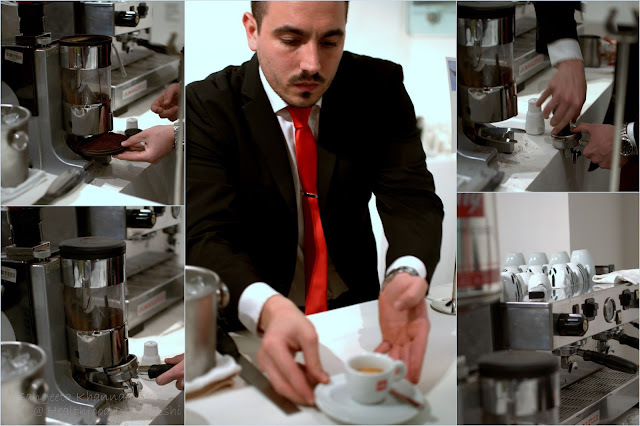 Nicola is a young man who started early in life with the art of coffee making. I started with a double espresso shot and started discussing how to make a good cup of coffee. The blend of Arabica and Robusta coffee is of course a deciding factor for a good cup, but the extraction and temperature of water and milk etc is also important. He said coffee from places around Bangalore is the best and is used in Illy coffee blends. But the way Indians make coffee is very different from how it is enjoyed in other places. I agree, we all treat the same drink differently, associate with it differently. Nicola enlightened me that the water should be at 65 C for espresso, anything beyond that will not result in optimal flavors. I found it true, and was reminded why we all wait for the coffee to cool down a bit when it was made with boiling hot water. He told me the milk also should be 65 C as the sugars and proteins in the milk start caramalising above this temperature. Now about milk I am sure most Indians love that caramalised flavor in their chai or coffee? We even like some fresh cream in our chai or coffee, all boiled down to reduce it, make it thicker, sometimes almost syrupy. Coming back to Illy coffee standards, I learnt that espresso should be having spots on the surface, the margins that touch cup should also be striped. 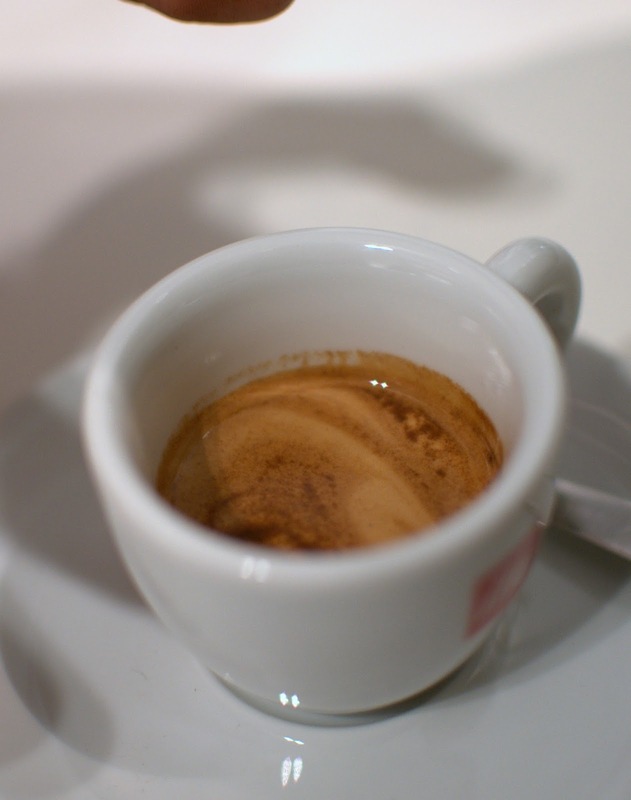 See how the tiger strips are an indication of a perfect espresso. Who knew that? Marchhino caldo was a nice coffee with chocolate sauce in it. See the recipe and imagine it at a comfortable temperature to enjoy. I tried Espreso greko too, but it didn't hit the spot with me. A cold black coffee is not my cuppa and it was a wet rainy day that day and this one didn't suit the weather. Cappuccino frecco was nice frothy and warm. A better version of the cappuccino that made my palate burn many a times when I was a kid. 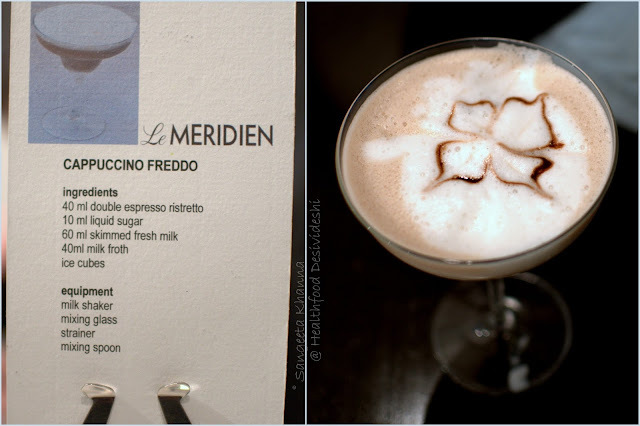 I remember we were allowed a cup of cappuccino in parties and that ended up invariably with a scalded palate. 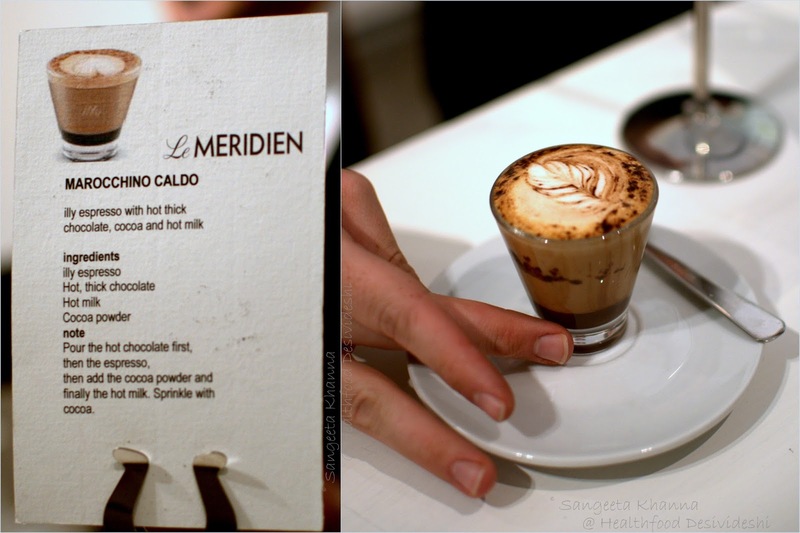 Who knew coffee has to be made and served at 65 C.
The art, the coffee and the new learning .. Among a lot of friendly banter, a few tidbits and meeting new people, the coffee was enjoyed. I definitely learned more about coffee that day. Talking to Suddhasattva Basu, I could relate well to his understanding of nature and connect with the universe as a whole. I agree art doesn't need any explanation and we can all interpret it in our own way. I liked his series called Sacred garden too. 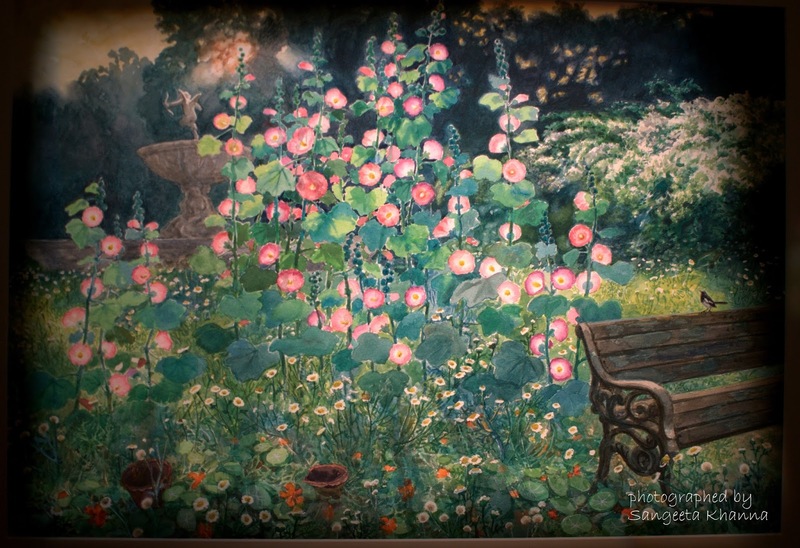 Much like a serene place where you see human presence in the form of a watering hose or a bench, but it was the birds that complete the picture of a garden for me. He had also displayed a mesmerizing animation film on the same theme. 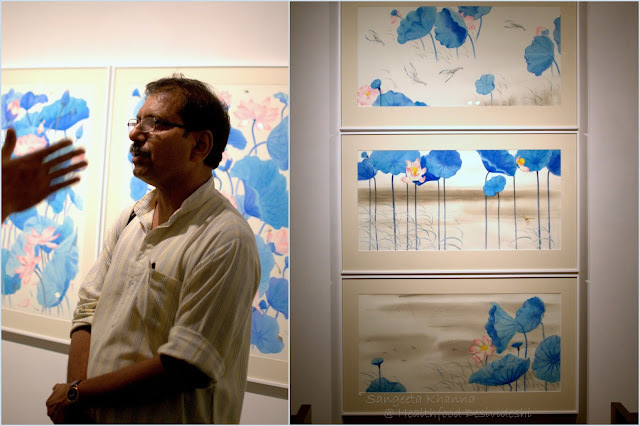 'Parasparopagriha jeevanam' that translates to 'interdependence of life' was the theme of his series of art on display. I know, as if it was an art experience waiting for me exclusively, or that's what I would like to believe. Now you know it was a lovely day for me. Thanks to Anasuya Basu and Meena Bhatia from Le Meridien for organizing this wonderful evening. Caffeine and art is a heady mix, I loved the cocktail. Illy coffee will always be the charm at Le Meridien as Nicola trained the team of baristi there. I think ishould write something about filter coffee here, as it is my early morning fuel to run around. As the chef has rightly pointed out, coffee from the plantations in karnataka are always good. We once visited the famous panduranga coffee at chikmagalur.The coffee seeds are roasted without generating excess heat and ground. After the panduranga experience, we prefer a mixture of plantation A plus, peaberry plus robusta seeds. The 80% coffee powder is mixed with 20% chicory to give thickness to the dicoction. In this proportion 3 heaped teaspoons of coffee powder is required to prepare coffee for 2 people. We prefer fresh coffee everytime and never store the decoction. We buy local coffee powder in this proportion and relish fresh coffee everyday. Next comes the challenge of getting the froth. We serve the coffee in a tumbler and dabara, pour a little coffee from the tumbler to the dabara and swirl it around to cool a little before sipping it. This is a beautiful write up and am enjoying every word of it as i enjoy every sip of my coffee. 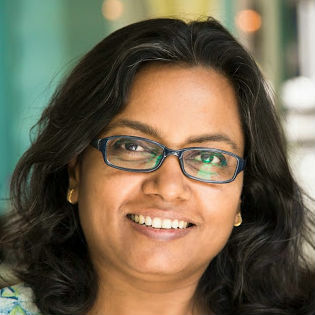 Sangeeta what you described is called beaten coffee in West Bengal. My friend taught it to me and it is a easy way to tasty coffee. And the 65 c thing is an eye opener, will save energy from now on.Having milky coffee (as most Indians do) is a problem In Europe. Mostly the milk is served chilled and adding it to the coffee results in lukewarm coffee. I am a big fan of filter coffee and love to have it in steel tumblers Indian style. Pity there are so many fancy coffee shops that charge extravagantly but it is so difficult to get a decent cup of filter coffee. There is a small shop in Connaught place that sells different variety of filter coffee and equipment and it is run by Coffee Board. I get my coffee from England as it is much superior and packed in lovely glass jars. It is probably grown in Karnataka but that is the story of our country. The best stuff goes abroad to earn foreign exchange. Neither did I! Will keep it in mind next time I venture south.